A quality baby bedding set is essential in making your nursery warm and inviting. Cotton Tale uses quality materials and unique designs to create your perfect nursery. 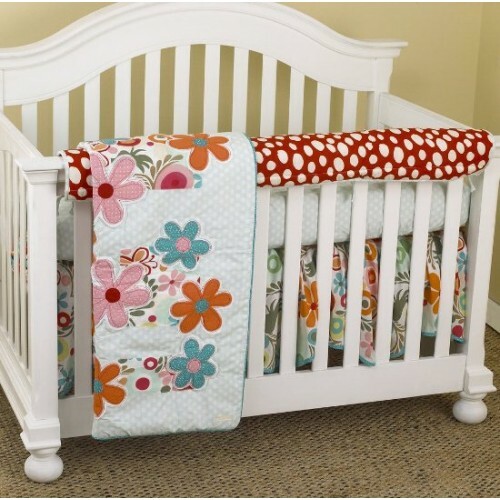 Lizzie Front Crib Rail Cover Up Set contains dust ruffle, fitted crib sheet, coverlet, and front rail cover up, it has lots of color in a bright cotton motif. The Lizzie front cover up is both function and design, measuring 51 x 15. What a great idea, this front rail cover up protects your foot board on the convertible cribs and it looks great. For the parent choosing not to use a bumper, it can add the needed decor lost when the bumper is removed. Large appliquéd daisies on a patchwork of big dot red, small red dot and a fancy contemporary floral. Accents in bright turquoise Sculptured dust ruffle with turquoise trim. Soft dot sheet 100%, 200 thread count cotton. Wash gentle cycle, separate, cold water. Tumble dry low or hang dry. This collection is perfect for your little girl.